Sincere apologies for the delay on this! Here is the third and final part of my guide to night photography. In the first I covered conventional long exposures with a tripod and Star Trails. In the second I covered Lightning and Fireworks. In this one, I will discuss taking shots of the moon and the rather liberating handheld night photography. 1) To get the best possible results from the kit you use you will definitely need a tripod, and either use a 2 sec delay timer or a remote trigger. 3) Manual focus with Live View and digital zoom helps. Even if you are using a 500mm lens, you'll still need to get in closer to be really sure you've got the focus spot on. Using Live View and zooming in further digitally really helps here. 4) The mm matters! Might sound obvious, but if the longest lens you've got is 300mm, you are likely not going to get decent results. If you have an exceptional 300mm lens like the DA* 300mm and an exceptional teleconverter like the famous Pentax 1.7 AF, then that's a very workable combination. Additionally, you could get away with a 300mm lens if you attached it to the Pentax Q (or Q10) via an adapter. This would give you an equivalent 'focal length' of 1100mm! Otherwise you should really be sticking a 500mm lens in front of your camera. Sigma have always done reasonably prices 500mm lenses, which can crop up second hand for even better prices, such as the Bigma (50-500) or the earlier 170-500. The newer 150-500 HSM has great reviews too. But there is a cheaper option still, the samyang 500mm f6.3 mirror lens. You can get it for about £140 on ebay. I wont go into too much detail of mirror lenses. They have unusual bokeh (out of focus blur) where high contrast areas look like doghnut rings. Too distracting for me to use for general purposes (though not for many - this is only my opinion), but for astro photography this is where these types of lenses can really shine. 4) Aperture. Stick with as small an aperture if you can without sacrificing sharpness - not too small and you'll make the shots less defined. Experiment with a few shots at different apertures and see what works best with your lens. Definitely avoid shooting at max aperture. 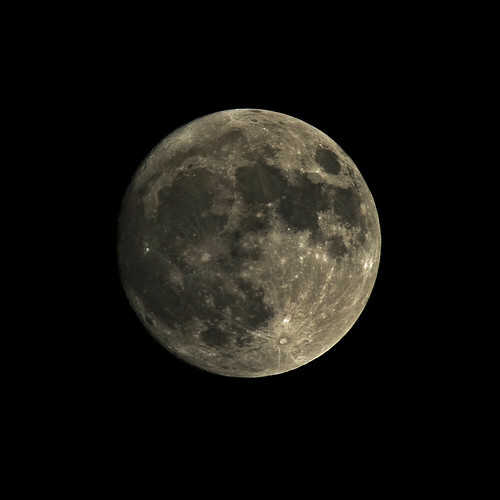 5) You get more detail from the moon when its not a full moon. It might not look as dramatic, or 'perfect' maybe, but when the moon is fully lit by the sun, there is detail loss. It of course all depends on what you are after, but if you decide to take shots of the moon just before or after a full moon, you'll no doubt get better detail in craters etc at the edges where coverage from the sun starts to wane. 6) The moon cycle. Get as prepared as you can and use the The Photographer’s Ephemeris to plan ahead and know the moon cycle. 7) Clarity. Everything is of course all dependent on whether you get a clear night - or at least a clear shot of the moon for a few moments. Patience is useful here! 8 ) Post Processing. If you are satisfied you've got the best out of your kit on the night, there's no reason you can't enhance it slightly with a bit of sharpening during post processing. It is a tightrope however - too much and it looks artificial. Play around, but don't be too excessive. Here I will discuss wandering out into the night with your camera, a lens and nothing else. Not even a flash. First a disclaimer or two: This is perhaps more viable on models much as the K-x, K-r, K30, K5, K5II and K5IIs where ISO performance is much better. It's also better if you have a fast aperture lens. At least f2.8, but preferably f1.4. 1) Use the widest aperture you can. I tend to use aperture priority and programme in the widest setting. 2) Set your camera to auto ISO from 100/200 to 3200. If you have a K5 or K5II you might be able to push it more towards 6400 as the upper limit. 3) A steady hand helps. Light is still at a bit of a premium, and even though you are using fast glass and a high ISO, it still isn't as easy as shooting in the daytime. I find just leaning on walls or kneeling on one foot just gives that extra bit of stability and keeps your shots sharp. If you find you need more stabilty a monopod is an option, but by definition we are then not exactly in hand-held territory. Monopods are more restrictive than being 'hands free' but still far easier than tripods. 4) Choose your shot wisely. Again, light is at a premium, so don't expect to be able to shoot down a dark alley with hardly any illumination. You must carefully use the light you have available. It might all still sound a little restrictive, but it's not. You are able to take a great deal more photos in that particular outing than you could with longer exposures and lugging a tripod around. If something is not quite working, find a different spot, you'll soon be snapping away again. Finally, I hope you have enjoyed and got something out of my three night photography guides. I don't want to suggest for a moment I'm an expert at photography. I just enjoy it and have been fortunate to get decent results in a wide variety of conditions. I hope there has been value to some in me sharing my experience and advice! I wish you all the best in your journey in photography.